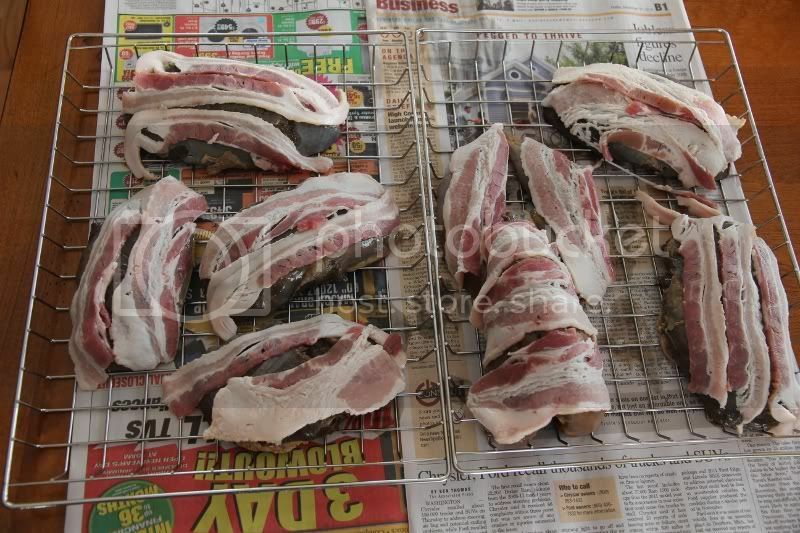 Smoked wild pheasant and goose | Smoking Meat Forums - The Best Barbecue Discussion Forum On Earth! Discussion in 'Roll Call' started by liles1, Dec 29, 2010. I just got a Bradley original for Christmas and am going to smoke some wild pheasants and goose breasts later this week for the maiden voyage. I have done a few pheasants on a Weber grill in the past and they turned out great. I am eager to try the smoker and see if it simplifies the process. I have not smoked goose but have done lots of jerky so we will see. I soak the birds in a brine (recipe later) overnight and then lay bacon on the breasts to add fat and moisture. I will try and get some pictures and let everyone know how the birds turn out. Wish me luck. Welcome to SMF glad you joined us. Congrats on the new smoker the birds sound good. I'm going to move your thread to the Roll Call section so you can get a proper welcome. Welcome aboard! Glad you found us!! Welcome to the forum. I'm looking forward to some pictures of your smoked birds. Thanks for the welcome. Just put the birds in the brine and I'll start smoking tomorrow. First off Welcome Liles to SMF. I really like some grilled pheasant but goose I have smoked and it wasn't the best but heck give it a shot you might love it. You'll like it here for there are alot of really good folks here that would just love to help you with just about anything to do with smoking. Now there are alot of proven recipes for some amazing things here too. So if you need sign up for the E-Course it's free and it will give you the basics of smoking and some good methods to use also. So the next big thing for you to do is go out and get you something to smoke and if you happen to have any questions just post it here and we will be happy to answer them for you. Yeah, I've never done goose smoked so I am interested to see how they turn out. I have done a lot of goose jerky and it is usually a hit with everyone that tries it. Should know by tomorrow night if I can get the smoker up to temp in the cold weather we are having. Well, things went as I suspected with the weather. Smoker preheated fine, but after putting meat in (it was a lot) the smoke would not get above 150. I decided to smoke the meat for about 2 hrs and then transferred to the oven to finish to temp. Everything turned out incredible. My wife and kids could not get enough of the pheasant and my wife even ate the goose and said it was good. This is amazing since she won't eat anything that even remotely has a gamy taste. I was burnt out on smoke last night so I didn't eat much but we ate both today and the kids said the pheasant tasted "like smoked turkey". I ate the goose cold today and I would have sworn that it tasted like cold roast beef. I was out of horseradish, but tomorrow I am going to get some and make a sandwich. All in all it was a good first go with the smoker but I think I will have to do some mods for the cold weather and large loads. I took a picture of the meat before it went into the smoke but forgot about after shots with the chaos of oven finishing and getting ready for New Years. Here is the brine I used which I picked up on the internet a few years back. I don't know who to give credit to, but the brine has been a sure thing with everything I've tried. Here is a pic of the finished product. Nice work guys. I too am new to this, but hooked already. My pappy got me a Bradley for Christmas, and on the 31st with a fresh harvest of mallards, a pintail, and some teal, I felt obligated to test this puppy out. I used a recipe that I found online, took a gamble, and hit one out of the park. I had some family/friends over for dinner, and to test out the inaugural smoking too. They all raved about the duck, loved it. I vacuum sealed what we didn't eat. Tonight, I am trying the rest of the harvest out: 3 Canada geese, cut into strips, marinated for 10 hours, and I just put in at 150 with some mesquite to make jerky. We'll see. Thanks for all the mouth-watering recipes here!